Including an invoice and packing list when you are shipping a package, is the best practice, which establishes an extra line of communication between you and the customer. It serves as a confirmation of what the package contains. Invoicing creates a positive vibe for your e-commerce customers. To run your business successfully, it is essential to integrate a billing solution to send out invoices automatically from your e-commerce store. When you sell internationally, it is a standard requirement in many countries to include an invoice. All the documents that are integral to shipping (like PDF invoice, packing slips, delivery notes, and shipping/address labels)will be automatically generated with this WooCommerce extension. An Invoice is a detailed statement generated by the seller containing information related to goods sold or shipped. You can get to this section by navigating to Invoice/Pack List menu from your WordPress dashboard. When you click on the Invoice tab, you will be taken to Invoice settings. 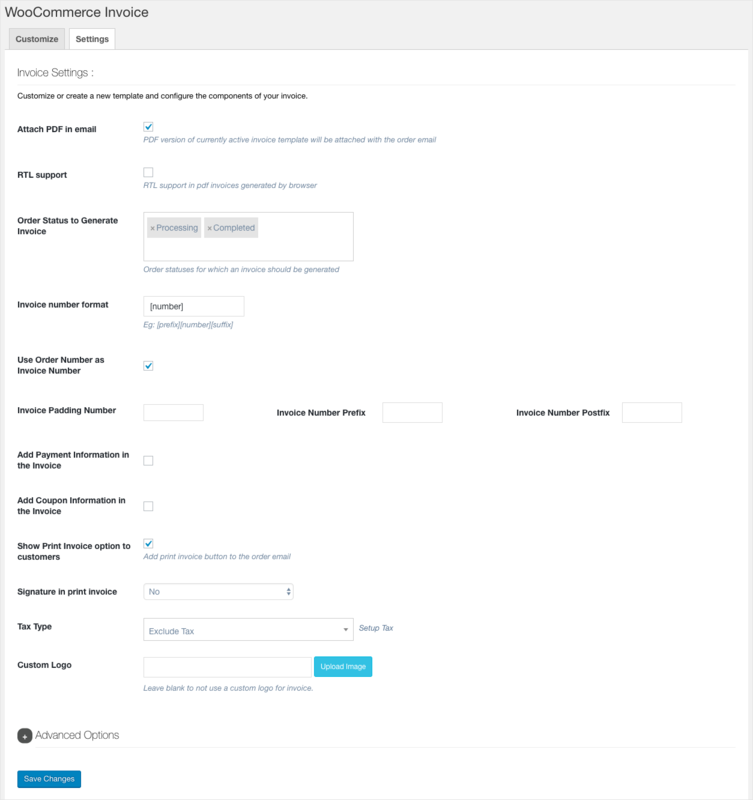 Select a template or customize a template to better fit your requirements from the Customize tab. List all the order status for which invoices can be generated. Customize invoice number – either use order number as the invoice number or set custom order number based on certain parameters(can be auto-generated with a prefix, suffix, or padding option). Add Payment and Coupon information. Display a print invoice button for your customers. Set custom logo for invoice. There is an Advanced Options section, where you can configure additional fields on checkout page and invoice. For detailed information about all these fields, you can refer the Product Page. Packing Slip/List is a document containing an itemized list of products, without providing the price information. When you click on the Packing Slip tab, you will be taken to Packing Slip settings. Select a template and you can Customize the chosen template. Remove total weight column from product table of the packing slip. 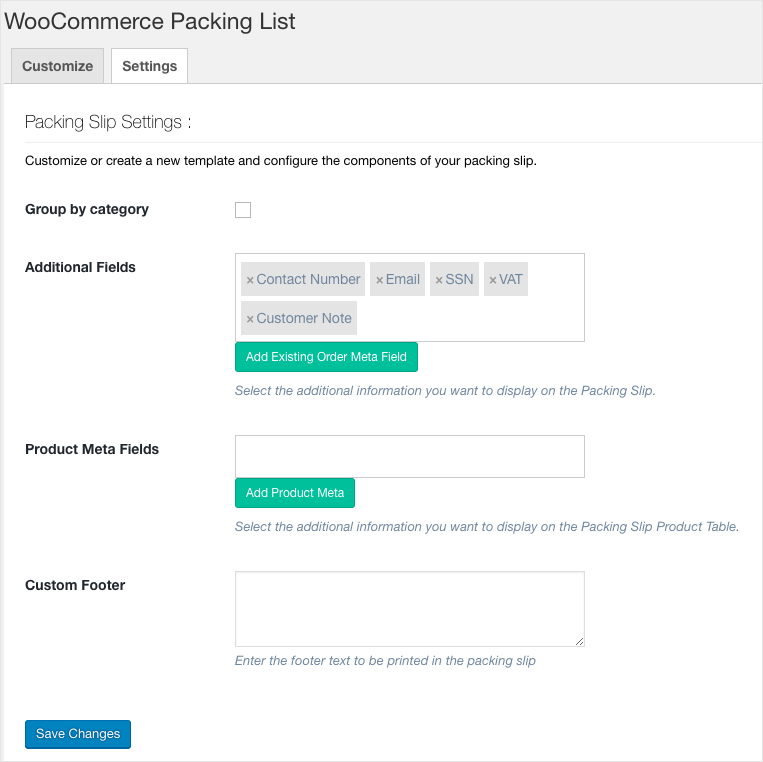 Set a custom footer for packing slips. Can you add custom fields creacted by “checkout editor pro”? – Didn’t see this in the documentation. You can add custom fields to labels via the Add Existing Order Meta option available under the settings. You can enter the meta key and field name to print the meta. To get the corresponding meta keys, please contact corresponding plugin developers or you may refer their articles. cannot add woocommerce aditional fields to invoice !!!!!!!! We have reached you via support ticket regarding the issue. Please respond via the same.